Why Do London's Black Actors Always Play Americans? Rachel Stoplar Why Do London's Black Actors Always Play Americans? Lucian Msamati (Toledo) and Giles Terera (Slow Drag) in rehearsal at the National Theatre. Photo copyright Johan Persson. Debate rages over the dominance of white middle-class men in British theatre and the continuation of fewer opportunities for black Londoners in the arts community. So a revival of Ma Rainey's Black Bottom at the National Theatre — which could easily be subtitled Art, Race, Power — couldn't really feel more on the button. Or could it? There's an elephant in the rehearsal room. We're behind the scenes with director Dominic Cooke and an all-British cast, surrounded by mood boards with black and white pictures of 1920s outfits, a map of the USA dotted with pins and post-it notes, and old school jazz on the score. But why are these predominantly London-born actors having to put on American accents in order to perform? Why do we need a play set in 1920s Chicago to allude to the experience of London almost a century later? Sharon D Clarke, playing the lead Ma Rainey, speaks up. "I'm an actress who's survived on American pieces. I'd like to see more of the London I've known all my life on the stage. I'm waiting!" O. T. Fagbenle, who plays the frustrated young trumpeter Levee, a kind of character prototype for the Civil Rights Movement, agrees. "We lean quite heavily on the African American play." That's not to write off the continued relevance of Ma Rainey's Black Bottom. Written in the 1980s, it was already using a period half a century past to speak to contemporary audiences. Wilson's jazz star Ma is battling her white manager and producer for control over her music — we don't have to make enormous imaginative leaps to conceive of a white organisation profiting from black culture today. Nor do we have to think hard to envision a policeman singling out a black person for supposed criminality today. These are the scenes we witness in the National Theatre rehearsal room, and, boy, are they powerful. Clarke may be wearing a '90s-style bright orange jumper underneath her glamorous Jazz Age fur coat, she may be singing into a cardboard cutout of a microphone and Lucian Msamati's Toledo may be playing a keyboard balanced on a plywood piano. But the minute they open their mouths we're transported. As Msamati remarks, "the scene with the policeman — that is real, and some might argue, that is still the case." We don't have to make enormous imaginative leaps to conceive of a white organisation profiting from black culture today. Clarke's rich bluesy voice and commanding presence are particularly powerful from a metre away, so when she tells us after the rehearsal that she sees Ma as a 1920s Beyoncé, we can certainly relate. And that British Beyoncé? Fagbenle reckons the establishment needs to give opportunities to writers and directors to create these roles, while Clarke figures we need more black actors in established plays. Let's hope those seeds start bearing fruit, fast. 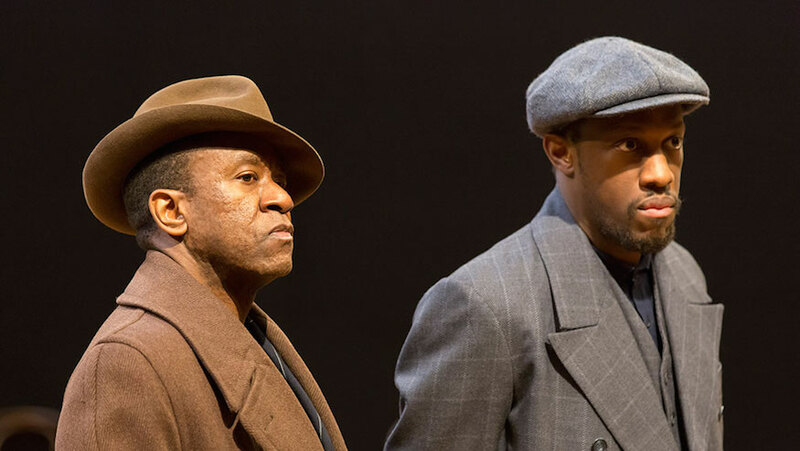 Ma Rainey's Black Bottom is on at the National Theatre until 18 May. Tickets £15-£55.